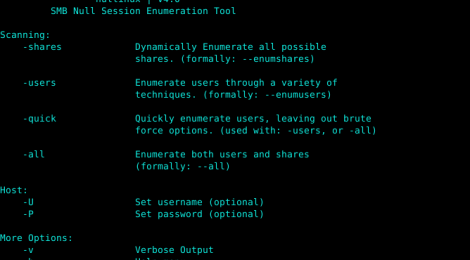 Browse: Home / nullinux – linux SMB null session identification and enumeration tool. nullinux is an internal penetration testing tool for Linux that can be used to enumerate OS information, domain information, shares, directories, and users through SMB null sessions. Unlike many of the enumeration tools out there already, nullinux can enumerate multiple targets at once and when finished, creates a users.txt file of all users found on the host(s). This file is formatted for direct implementation and further exploitation. ← WindowsSpyBlocker – Block spying and tracking on Windows.